IMG_0838, originally uploaded by arcticpenguin. In a post earlier this week at Legal Blog Watch, I wrote about the 10th anniversary conference of Harvard Law School’s Berkman Center for Internet & Society and Harvard’s “courtship” of Jonathan Zittrain to accept a tenured position on its faculty. 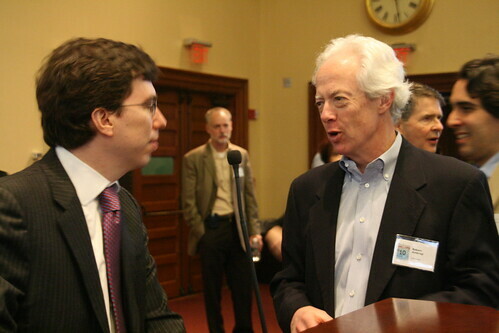 Looking at photos from the conference on Flickr, I found this one of me speaking to Zittrain during a break. What you can’t see is the Zoom H2 MP3 recorder in my hand, as I try to snag an interview with Zittrain for my Lawyer2Lawyerpodcast. He deferred until later in the day, but that later never came.